Wide open spaces and freedom outdoors! What if you decided to trade your skateboard, scooter or bike for a landsailer? How about a one-way ticket to a breath of fresh air? This is the promise of an unforgettable adventure with family or friends over 20 kilometers of beach between the Bay of Authie and the Bay of Somme! Don’t miss it – it’s an exceptional setting in the midst of nature along an idyllic dune ridge. 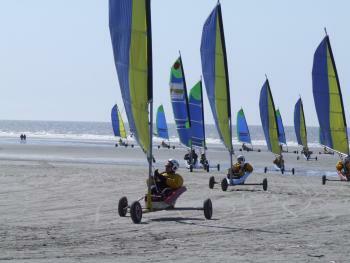 What’s nice about land sailing is that anyone can do it, no matter what their level! Don’t be afraid to bring your children along! The wind speed gives you the impression that you’re lifting off the ground. It’s magic! You’ll feel at ease right away, as if you’d been doing it your entire life! Traveling along the seaside and crossing beautiful open spaces at a high speed is not something just anyone can do at any time! The most beautiful moment is seeing the shimmering colors of the setting sun at the end of the day. In sum, total happiness! And there’s more! When your adventure is over, take a moment to share a tasty bowl of hot chocolate with local residents in the café-gallery on Bay land left behind by the sea at Noyelles sur Mer. You’ll enjoy a warm, convivial atmosphere! Land-sailing can be done any time of year! There are two land-sailing schools on the Bay of Somme.